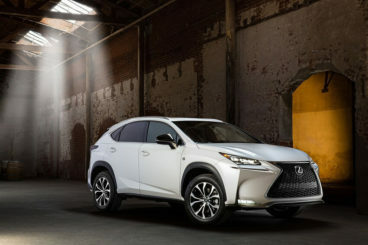 No premium manufacturer’s range seems to be complete without a mid-size SUV, and Lexus are certainly not a brand to miss out on a killing, with their new Lexus NX300h their version of the Audi Q5 and the BMW X3. Coming with a petrol-electric hybrid power train and no diesel engine, it’s a car that doesn’t do things the normal way. Let’s take a closer look at what it offers with our Lexus NX300h review. 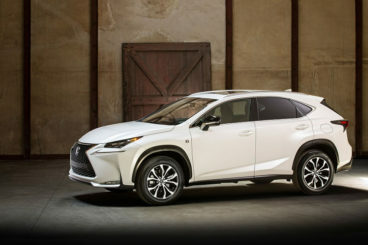 We’d all love to live in ideal world, where money grows on trees, it never rains, and a Lexus NX300h breezes down the street with a dreamy ride quality. Sure, this a very competent crossover, but if you’re taking this car down some of the UK’s poorest roads, you’re gonna be in for a bumpy old ride. Propped up by 18” wheels, it’s a bit too stiff at low speeds for our liking as you make your way through town, but roll it out on a smooth A-road, and you’ll find that it – finally – comes into its own. Drivability then, is overall not too bad, but it does need to be softer. Braking though, is a bit problematic for this hybrid; at the mere touch of your big toe, drag effect goes through the roof. Road testers handed out a few criticisms at the Lexus NX300h’s power train – such as detachment – but Lexus are certain that customers don’t have the same gripes. And we tend to agree with Lexus on this one. If you take it through traffic and stroll along modestly, you’ll find refinement is decent and could give even a refined diesel a run for its money. For a car of this size and bulk, performance is pretty much what you’d expect and feels right. In terms of acceleration, the Lexus NX300h gets to 60mph from rest in 9.5seconds. Earlier, we said that the Lexus NX300h doesn’t do things the normal way, and this is certainly true of the interior. When you step inside a car like this one, you expect to find soft-touch plastics. Lexus, though, throw a curveball at you by fitting their Lexus NX300h with novel surfaces. Wood and metal replaced matt plastic, with highly technical grains the order of the day here. It’s premium but, somehow or another, it’s premium in a way you’d least expect. We like. The driving position is good, whilst a finely-sculpted wheel is a nice touch. The ergonomics are pleasing throughout, though there are quite a lot of buttons on the dash to get your head around. 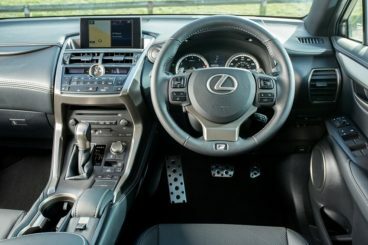 Phones connect easily to the new software, whilst the new audio systems are now in line with exactly the kind of quality you’d want from a new Lexus NX300h. If you fold the rear seats, Lexus say you’ll be treated to the lengthiest load bay in its class, whilst head, leg and shoulder room for both front and rear passengers is overall good. 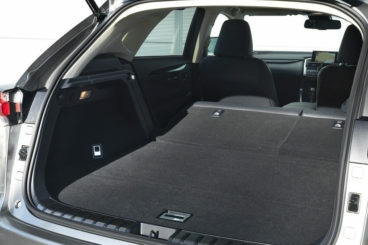 There are also plenty of storage bins dotted around the place to ensure your Lexus NX300h doesn’t become messy. 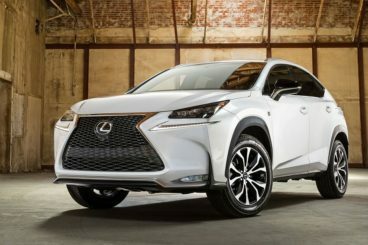 The Lexus NX300h price range starts out from around £29,495, whilst buyers will be able to get their hands on a used Lexus NX300h for a little bit less. Five trims are available: S, SE, Luxury, F, Sport and Premier. Standard equipment across the range includes adaptive cruise control, a DAB digital radio, dual-zone climate and Bluetooth connectivity. There is a NX200t petrol variant due anytime now, whilst missions are good and the base-level model has the potential to save a tax payer £1,000 more than a BMW X3. Smashing. 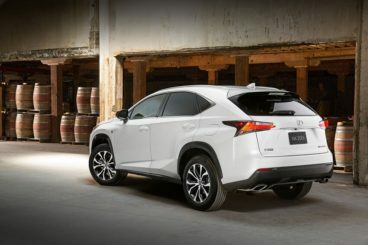 There are things you’re always sure to get from a premium brand like Lexus; you’ll get the premium brand appeal, and you’ll get exemplary customer service. Chuck in high quality and finish, and many buyers will be as happy as sand boys. Going for a top-of-the-range Lexus NX300h is sure to be pricey, but when you look at the kit they come with – ventilated leather seats, heated steering wheel, surround audio – it’s hard not to be seduced. The Lexus NX300h makes a lot of sense as a compact SUV for buyers looking to save a bit on running costs; handsome, quiet, and well equipped. If you want to get hold of the new Lexus NX300h don’t hesitate to leave us a message on our contact page, or give us a call on 01903 538835 to find out more about our Lexus lease deals.